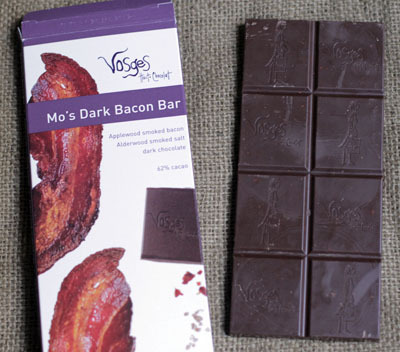 A few years ago, we reviewed Mo’s Bacon Bar – a milk chocolate bar filled with bacon. The verdict was that the bar was good, but that maybe the milk chocolate didn’t quite have what it takes to stand up to the applewood smoked bacon. Well, I found Mo’s Dark Bacon Bar at World Market, and I’m here to tell you what I think. Does the dark chocolate make the bacon sing? When I bite into it: Chocolate is the perfect texture and darkness. Not too dark, and very smooth. The bits of alderwood smoked salt crunch, and the flavor goes very well with this chocolate. Small pieces of bacon manage to be crispy, yet slightly chewy. Pretty close to the perfect texture of a regular piece of bacon. I feel like it’s quite a feat to get that perfect bacon texture inside a perfectly textured chocolate. In other words, win. Second impression: It’s really good. Sure, bacon’s a popular additive to sweets these days, but often the bacon is more of a novelty than an actual good decision. The bacon in Mo’s Dark Bacon Bar is definitely not just a novelty. The bacon and salt elevate the chocolate to something very special that is made very well. I have been eating this chocolate bar, with pleasure, since I first picked it up. One delicious square at a time. This bar is definitely recommended for those who like a marriage of sweet and salty, and anyone who needs a little extra bacon in their lives. Con: The only con is the price tag, but the candy is so good that I would say it’s a worthwhile indulgence for once in awhile. I love bacon and as a result I have received this candy bar as a gift on two separate occasions. I wanted to like it and figured I would love it but the bacon is just too salty. The dark chocolate isn’t overly sweet so in my opinion the extra salt added isn’t needed. Bacon already has plenty of sodium in it to combine nicely with the chocolate flavor on its own. What on earth? Bacon and chocolate? America never ceases to anaze me lol.